Everyone may be buzzing about how great the Street Fighter re-launch is, or how Dragon Ball FighterZ is flattening everyone (both true), but let’s not forget that The King Of Fighters XIV is still a surprisingly solid fighting game with an enormous cast of playable fighters. That cast is set to get a little bit bigger in 2018. 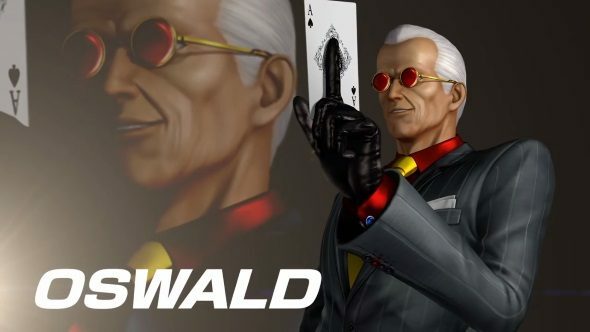 There’s four more characters on their way, the first of which is the little-known Oswald from King of Fighters XI; a man who probably laughs far too hard at “In Soviet Russia, deck cuts you.” jokes. With over 44k players online at launch, Dragon Ball FighterZ has truly expanded the market for fighting games on PC. Maybe the next King of Fighters will be a bigger hit? Oswald’s gimmick is fairly self-explanatory. He uses playing cards – lots of them – as projectiles, as a defensive shield, as melee bladed weapons and more. I bet he sometimes even plays solitaire with them, even if he does run the risk of deadly paper-cuts every time. KoF is a tag-team game though, and the remaining three DLC characters will probably synergise well with him. In a little teaser image (also seen in the trailer), you can see the silhouettes of the new season’s DLC characters alongside him. Judging from the flowing/tattered sleeve visible on the right side of the teaser image, one of those four DLC characters is set to be this mysterious lady (credit to Gematsu), the winning character design in a recent fan-art contest held in the middle east. This entry from Saudi Arabia took the prize, and she’s a pretty striking looking character, I must admit. The ‘living shadow-nightmare dress’ look is very in this winter. Sadly, there’s no fixed date on when Oswald or the rest of his crew will be hitting the PC version, but you can be fairly sure that the game – available on Steam – will be discounted at least once more before the launch of the new characters.